Rotary Club of Linlithgow Grange - Welcome! President Iain Keter presenting a cheque to Myra Lawson for Sunshine Singers. The Rotary Club of Linlithgow Grange is a vibrant, active club of over 40 members which meets every Monday at 6.30pm for 7pm at Linlithgow Golf Club (Braehead, Linlithgow, EH49 6QF). A warm welcome awaits any Rotarian or guest attending our Club meetings. Please join us for our entertaining and informative programme of speakers during this Rotary year. Please scroll/swipe down through this page to find out more about us in addition to the pages linked in the 'hamburger' in the menu (top left). Tom Brown, Jim Gillespie, John Leitch and Peter Russell. 15th April (Mon) Weekly meeting: Speaker - Diana Kerr on Singing Groups for People With Dementia. 22nd April (Mon): Easter - no meeting. 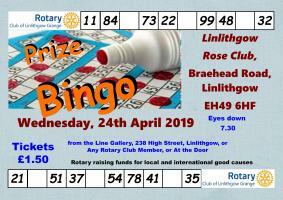 24th April (Wed): Prize Bingo Night at Linlithgow Rose Club. 29th April (Mon) Weekly meeting: Speaker from the Rock Trust. 6th May (Mon) Weekly meeting: Scatter week - no club meeting. 13th May (Mon) Weekly meeting: Scatter week reports. 20th May (Mon) Weekly meeting: Speaker host - Alan Faulds. 27th May (Mon) Weekly meeting: Business meeting. What is Rotary International? An organisation of 1.2 million similarly minded men and women of all ages and backgrounds around the world volunteering to support Communities both locally and internationally. If you think you would like to become involved with Rotary, please click on the "Interested in Rotary?" button on the Contact page and someone will get in touch with you as soon as possible.